Will more Zynga employees be on their way out the door, as the company continues to struggle after going public only eight months ago? Yes, indeed, if morale at the San Francisco-based social games company continues to sink as quickly as its stock has been dropping. It’s the unfortunate flip side of a company that has stressed that its employees should be their own CEO and “move at Zynga speed.” It’s a culture driven by analytics, where every move is recorded, measured and evaluated. Now it appears that the long hours and taxing work environment are causing the inevitable — some are deciding to leave, especially as shares trade 70 percent lower than the company’s public offering. Several sources at other companies say they’ve started seeing a “flood of resumes” in recent weeks from Zynga developers looking for jobs or trying to raise capital. To be sure, at times, it can also be business as usual. During the company’s 16th all-hands quarterly meeting today, CEO Mark Pincus reportedly talked about the company’s future, and fielded tough questions from the crowd as he usually does, according to a Zynga spokesperson, who declined to elaborate on the state of morale. But if an employee hasn’t bought into the company’s mission by now, the past three weeks haven’t helped. 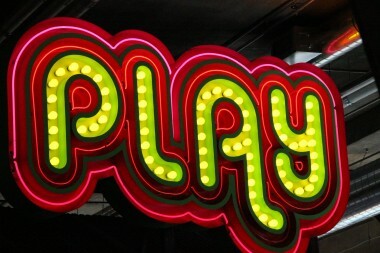 On Wednesday, Zynga’s COO John Schappert resigned, after only 15 months on the job. And two weeks ago, Zynga reported a second-quarter earnings flop that led to its stock sliding by 40 percent. It has remained relatively stable at these depressed levels ever since, and closed today at $3.01 a share. In addition, the company has also been hounded by at least two lawsuits — one targeting its management team, and the other, its games. 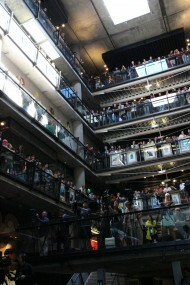 Employees at Zynga’s headquarters gather around the atrium at its 2012 Unleashed event. The first suit is alleging that executives made false and misleading statements in order to liquidate their personal holdings at elevated prices four months after the IPO. In the suit, filed Tuesday in the U.S. District Court of Northern California, it named Zynga and a dozen of its executives and board members as defendants. In the company’s secondary offering, Pincus sold about $200 million in shares; Schappert sold $3.9 million; and CTO Cadir Lee sold $13.6 million. But low-level employees were prohibited from participating in the sale, which also isn’t helping with morale, according to numerous staffers. The second legal blow was a copyright-infringement lawsuit filed by Electronic Arts, which alleges that Zynga is making an “unmistakable copy” of its game, The Sims Social. 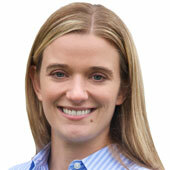 In some respects, Zynga has made it fairly far without a talent drain. In comparison, it took only three months for there to be at least three notable departures from Facebook, the social network that it works with very closely, and which is also suffering from post-IPO stock woes. Another point that employees can celebrate is that most have been awarded stock grants, and not options. The benefit of grants is they can’t ever be underwater. That said, for employees who are heavily compensated by stock, it may not mean much, as they’ve watched their net worth on paper drop by 70 percent over the past few months. At those rates, it’s the difference between being able to afford a nice house and buying a nice car. For a majority of the 3,000-plus employees, many are also short-timers, which creates another issue. Without a long history at the company, it may be hard for some to feel nostalgic about staying during difficult times. According to a document filed with the Securities and Exchange Commission, Zynga said 80 percent of the staff has been there less than two years. In fact, many employees have joined the company through a dozen or more acquisitions. This short tenure could potentially represent an ongoing challenge for Zynga to manage, as it tries to figure out how to create a sense of dedication among its employees. Otherwise, Zynga can be like many other Silicon Valley companies offering free lunch and other perks. But now, some employees think it might be the time to pull out the checkbook and spend some of the $1 billion it raised in its IPO on retention bonuses. In a statement, Pincus said that Schappert’s departure was amicable and had nothing to do with the company’s operations — in other words, it was Schappert’s decision to resign. But if Zynga doesn’t find a catalyst to get its stock moving in the right direction, it’s not a risky bet that investors could see other such “voluntary” departures in the near future.